The state pension age officially equalises today, meaning that from now on no man will qualify for a state pension at an older age than a woman. The process started on 5 November this year and took a month to complete. This is because people born between 7 November 1953 and 5 December 1953 were still a few days shy of 65. The state pension age for women has risen from 60 to 65 over an eight-year period, which started in 2010. Here, we look at why the state pension age has been equalised and what it will mean for your state pension entitlement. Why was the state pension age equalised? Plans to make the state pension age the same for both men and women were first announced in the 1993 Budget by then-Chancellor Kenneth Clarke. It was argued that this made sense, given women’s higher average life expectancy. The Pensions Act of 1995 legislated that the state pension age for women would increase from 60 to 65 between April 2010 and April 2020. But this process was sped up under the Pension Act 2011, which ruled that women’s state pension age would be increased to 65 in 2018, two years earlier than originally planned. From December 2018, the state pension age will rise for both women and men until it reaches 66 in October 2020. This has proved controversial because, due to the way that the state pension equalisation and age increase processes are working, women born in 1956 – who had previously expected to retire in 2016 at the age of 60 – will now have to wait until they’re 66. Many women who are affected say that they were not given adequate notice and time to rethink their retirement planning. A campaign group, Women Against State Pension Inequality (WASPI), has called on the government to compensate them for what they argue is lost state pension payments. In February 2018, the government rejected this call for redress. Find out more: state pension age increase: are you affected? Will the state pension age increase again? The state pension age is due to rise again, to 67, from 2026. Following a review carried out by the government in 2017, it was decided that the state pension age would increase by yet another year, to 68, from 2037. The table below shows the government’s timeline for state pension age increases. Use our state pension age calculator to find out how old you’ll be when you start receiving a state pension. While the state pension age has now been equalised, there is still inequality in the state pension entitlements of men and women. In April 2018, exclusive research by Which? uncovered the £29,000 state pension gender pay gap that affects women over a typical 20-year retirement. Analysing data from the Department for Work and Pensions, we found that the average man receives £153.86 a week, while women get a comparatively paltry £125.98. This inequality is likely to remain for some time, according to analysis from Hargreaves Lansdown. The main reasons for this are the continuing disparity between how much women and men are paid, plus differing working patterns. The state pension is a weekly payment from the government that you can receive once you reach state pension age. In order to qualify for the state pension, you need to make National Insurance contributions. You’ll need to have a minimum of 35 qualifying years to get the full amount of new state pension and at least 10 years’ worth of contributions to get anything at all. Workers who reached state pension age before the new state pension was introduced only need 30 years’ worth of National Insurance contributions to get the full basic state pension. 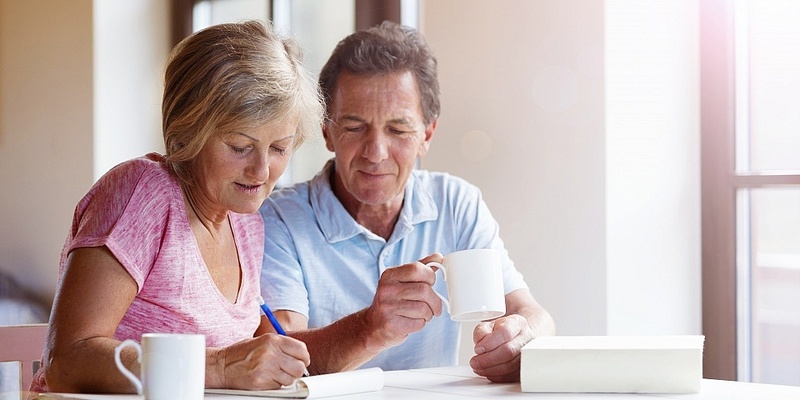 Find out more: what is the state pension? From April 2019, the state pension will increase by 2.6%, effectively giving pensioners a pay rise. This is because the state pension is protected by a ‘triple lock guarantee’, which means it goes up in line with whichever of the following is highest: CPI inflation, average earnings or 2.5%. In September 2018, it was announced that CPI Inflation was 2.4%, but average earnings had increased by 2.6% on the previous year. The graph below shows weekly state pension amounts from 2013 to 2020. Where can I check my state pension? You can use the government’s ‘Check your state pension’ service or, if you have one, your Personal Tax Account to get a state pension forecast. The Future Pension Centre of the Department for Work and Pensions (DWP) can provide further clarification about your state pension breakdown. It’s also possible for you to request that the DWP does a manual check on your state pension entitlement, although this can take a couple of months to complete. Check out our pensions guide for more information about the state pension and planning for retirement.